Inuit living along the northern coast of Labrador are the direct descendants of a precontact hunting society that spread across Canada from Alaska and centered on capturing massive bowhead whales. This culture, called Thule by archaeologists, quickly adapted to the mixed arctic and sub-arctic conditions found in the Labrador region. Not only were whales, seals, fish and caribou abundant, but also large forests were found in coastal areas. Wood was a rare resource in remote arctic areas and needed for making tools, boat frames and numerous other articles, as well as used as fuel for cooking. Early Inuit ancestors travelled southward along the Labrador coastline, likely following the migration of whales and herds of harp seals, to the Strait of Belle Isle. There they first made contact with Europeans, who were Basques from Spain looking for new whale hunting grounds. In the mid-16th century the Basques established land stations to process whale oil for export to foreign markets, but they were only present in southern Labrador during ice free seasons, from summer until late fall. Without a language or culture in common, Basques and Inuit were cautious about having face-to-face meetings. They conducted 'silent trade' exchanges in which goods were placed in small boats and sent from one side of a bay to the other side. Inuit also visited whaling stations in winter to scavenge for iron tools, fishing equipment and other European goods left behind at the sites. Inuit valued anything made of metal because the material was more durable than stone, bone or ivory that was customarily used in making hunting weapons and tools. Iron items were distributed along the coast through an inter-group trade network linking Inuit place-groups which occupied specific territories extending northward to the tip of the Labrador peninsula. A place-group, or band, consisted of families who were closely related and used a common hunting area, usually surrounding a major bay or fiord. Members of a band identified themselves by adding 'miut', meaning 'the people of,' to a prominent place in the area. After Basque whaling activities ended in about the 1620s, French sealers and fishers occupied their abandoned coastal stations and built new ones in the Strait of Belle Isle during the 17th and 18th centuries. Correspondingly, the Inuit demand for iron and other European manufactured goods increased during this period. But because most French fishing crews feared the Inuit, trade exchanges rarely occurred. As a result, Inuit began attacking isolated stations to get the goods they wanted, which led to counter assaults against Inuit by French workers. During this period, Inuit seeking European goods to resell in northerly areas usually spent the winter at a village on a small island near the present day community of Rigolet. Mutual hostility also characterized the relationship of Inuit with British fishermen and New England whalers, who took over French outposts after Labrador was transferred to the jurisdiction of Great Britain in 1763. Missionaries of the Moravian Church, a protestant church based in Germany, proposed making Inuit more peaceful by converting them to Christianity and providing them with European goods at trade stores that would operate at mission stations located in the Inuit homeland. The British Government supported the Moravian Church by awarding it extensive grants of land on the northern coast which became the foundation for communities based at Nain, Okak, Hopedale and Hebron. Despite centuries of contact and conflict with transient European fishermen, the lifestyle of Inuit described by early missionaries followed traditional patterns. People hunted game in all seasons of the year for food and material to craft articles needed for everyday life. They travelled in one person kayaks and larger umiaks framed with wood and covered by seal skins; wore clothing made from the pelts of seals in summer and caribou in winter; lived in skin tents during mild seasons; and settled during winter either in earthen huts banked by sods with a roof supported by whale ribs and shoulder blades, or in snow houses ingeniously shaped from blocks of hard snow. By the late 18th century, the Moravian missionaries had established themselves along the Labrador coast. 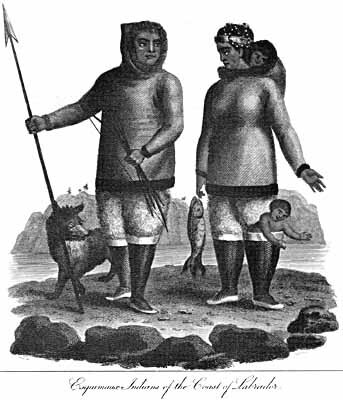 Since no original clothing from this period has survived, both written and pictorial records such as this engraving provide clues to the clothing worn by the Inuit during the early 1800s. "Esquimaux Indians of the Coast of Labrador" communicated by a Moravian missionary, drawn by Garret, engraved by Chapman, published by C. Jones, October 17, 1818. From Charles de Volpi, Newfoundland: A Pictorial Record (Sherbrooke, Quebec: Longman Canada Limited, ©1972) 15. The Inuit trade network disappeared, and their journeys to southern Labrador gradually ceased, as Moravian stores supplied people with imported articles that they wanted. While Inuit initially resisted abandoning their own spiritual beliefs for Christianity, aid given by missionaries to ill, elderly, widowed, orphaned and hungry people led to increasing numbers of converts in the early 19th century. Original place-groups were eventually absorbed into the congregations of Moravian stations which became the winter home for the majority of Inuit. With the declining presence of Inuit in southern Labrador, English fishing enterprises expanded and a permanent resident population developed. 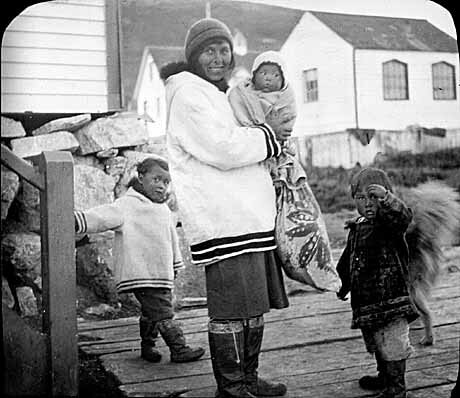 Several fishermen married Inuit women and formed families whose descendants remain in the region to this day. Courtesy of The Rooms Provincial Archives Division (B10-148). The Inuit population on the northern coast suffered from frequent epidemic diseases during the 19th century causing high death rates and severe declines in the size of the mission stations. The worst epidemic occurred in 1918 at Okak and Hebron, when an outbreak of influenza led to the death of two-thirds of the total Inuit population. During the 19th and 20th centuries, Inuit became increasingly dependant on a market economy and adopted new technology to earn income from natural resource industries centered on seal netting, cod fishing, fox trapping, and char and salmon fishing. The creation of a military airbase in 1942 at Goose Bay, and radar sites that were later built along the coast, introduced wage employment as an economic option for many Inuit. During the 1950s the residents of two northern villages, Okak and Hebron, were compelled to resettle at other existing communities when church, health and government officials decided that their social and economic welfare would be improved by living in larger centres. However, this program seriously disrupted the historical and cultural organization of the northern coast and had long-lasting negative consequences for resettled families. In 1973 the Labrador Inuit Association (LIA) was formed to promote the Inuit culture and advance the rights of Inuit to land which they traditionally harvested and occupied. The LIA submitted its land claim to the federal and provincial governments in 1977 and a final agreement was made in 2004 resulting in the creation of the Nunatsiavut Government a year later. For other Inuit related articles view the Aboriginal Peoples Table of Contents.